The storm-ravaged islands of Barbuda, St. Martin and Anguilla were spared a direct blow Saturday from Hurricane Jose, as its eye passed north of the chain but still threatened the Virgin Islands and Puerto Rico with potential "life-threatening" surf, forecasters said. The group of islands, known as the Leeward Islands, had braced for a second round of driving rain and destructive winds just three days after Hurricane Irma flattened buildings and left thousands homeless. At least 23 people have died as Irma continued ravaging the Caribbean. The powerful hurricane was pulling away from the northern Leeward Islands Saturday night, the National Hurricane Center said, although a tropical storm warning remained in effect for the islands of St. Martin and St. Barts. The hurricane center discontinued its tropical storm warnings for the islands of Barbuda and Anguilla that were in place for most of Saturday afternoon. The residents of Barbuda — still reeling from Irma — were forced to evacuate in fishing boats and private vessels to their sister island of Antigua ahead of the impending storm. The State Department issued travel advisories for U.S. citizens on the island of St. Martin on Saturday, urging residents to continue to shelter in place and not to travel to the airport unless they have departure plans. Jose was forecast to continue moving northwest after it was classified as a hurricane this week and quickly intensified to a Category 4 storm. Its winds were at 145 mph and about 85 miles north of the northern Leeward Islands on Saturday. It was not immediately clear how much more destruction Jose brought to Barbuda and the neighboring islands. 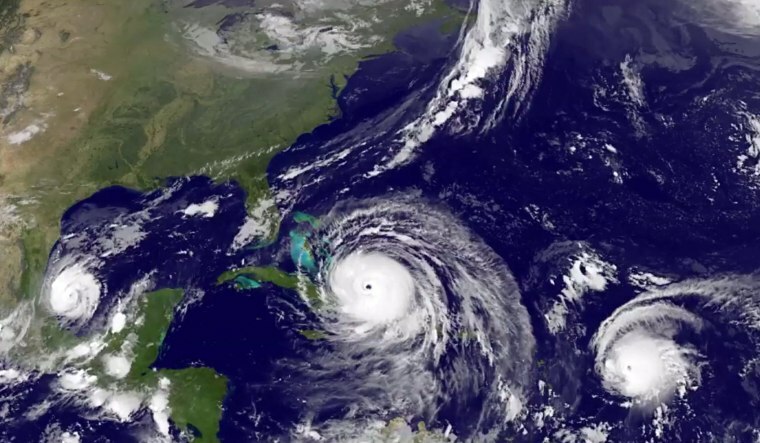 "The hurricane is likely to meander around in the Caribbean and southwest Atlantic for about a week," said Michael Palmer, lead meteorologist at The Weather Channel. "The question is whether it will stay between Bermuda and the Bahamas for the next few days, or it could be picked up in a low-pressure system and sit between Bermuda and the U.S.," he added. Hurricane Irma slammed into the easternmost islands of the Caribbean on Wednesday before moving on and lashing Haiti and the Dominican Republic before targeting Cuba and southern Florida. The powerful hurricane left a path of destruction in its wake, tearing off roofs, damaging buildings and bringing fearsome storm surges across the Caribbean. The French territory of St. Martin was being sent hundreds of more soldiers and police to restore order, French Prime Minister Édouard Philippe said Saturday. St. Martin saw several people killed and vast damage to homes, electricity and water supplies. The island's jail was also reportedly destroyed and its 250 inmates remained at large. Justin Cummings, 25, was in Sint Maarten, an independent nation within the Kingdom of the Netherlands, where he has been since August to help teach at a Brazilian Jiu-Jitsu academy. When the storm got bad they gathered at the apartment of an instructor's brother they thought would be safe. "It ended up being much worse than anyone thought it was going to be, and it was just devastating," Cummings, of Rye, New York, told NBC News in a phone interview. "First we thought the bedroom would be secure but the hurricane blasted through the living room and into the bedroom, so we had to retreat even farther back into this like cement closet," he said. The Dutch government estimates 70 percent of houses on St. Maarten were badly damaged or destroyed by Hurricane Irma, according to the Associated Press. On the island of Barbuda, which has a population of some 1,400 people, 90 percent of the buildings were destroyed, officials said. "If you know Barbuda before and what you saw, it's completely destroyed," Michael Joseph, president of the Red Cross in Antigua and Barbuda, who was in Barbuda this week, said Friday on MSNBC. Laura Saravia, Shamar Walters, Reuters and Associated Press contributed.